Multiple stakes sire Ivory James sired two finalists for the $35,000-added John Deere Texas Juvenile Challenge(G3) at Sam Houston Race Park. HOUSTON, TX�APRIL 28, 2017�Multiple stakes sire IVORY JAMES sired two trial winners and two finalists to the John Deere Texas Juvenile Challenge(G3) Friday night at Sam Houston Race Park. Jockey Francisco Garcia, Jr. had the riding call for trainer Brian Stroud to win the last of seven trials (race 10) with Ivory Noche, a homebred son of IVORY JAMES, for owner/breeder K & W Land and Cattle Co. 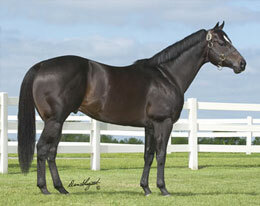 The sorrel gelding, out of Tres Dia Noche by Tres Seis, scored his second win in as many starts while posting the third fastest time of :18.115 seconds. Stroud's also saddled 4th fastest qualifier Ivory N Ashes, IVORY JAMES colt, in the sixth trial. The gray colt won by two-lengths and posted a :18.129 clocking. Another homebred, from the Runaway Rebel mare Sweeten My Dreams, Ivory N Ashes races for owner/breeder Alan and Sharon Colley. It was the first win two starts for the Texas-bred. The 10 fastest qualifiers will return to Sam Houston Race Park on Saturday, May 20th to vie for the winner's share of a $35,000-added purse going 350 yards. Also at stakes is a starting spot in the $130,000 Guaranteed John Deere Juvenile Challenge Championship(G3) to be contested October 14th during the Bank of America Challenge Championship Night at Prairie Meadows. For the complete list of qualifiers, times, sires, dams, owners, breeders, trainers and jockeys CLICK HERE.